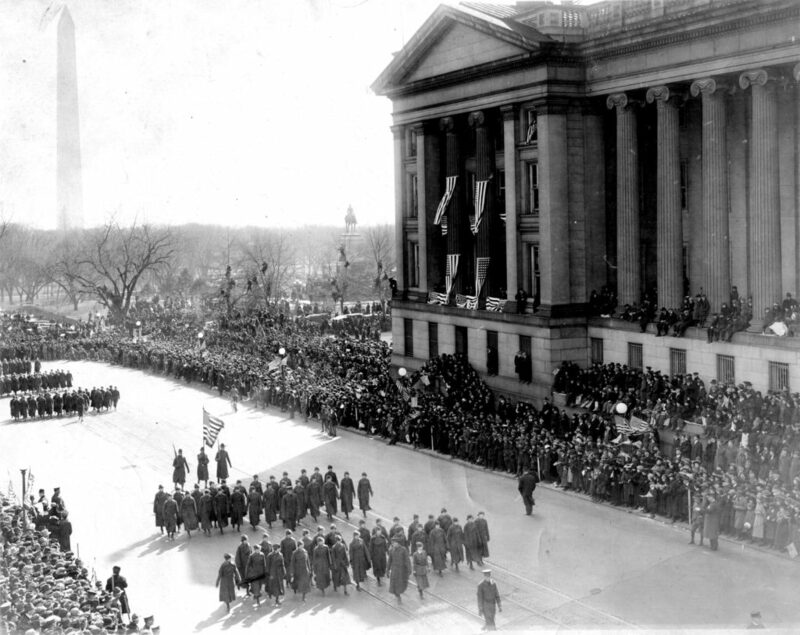 Women Marines, including Ouida Okey of Ohio, march in a 1919 military parade in Washington, D.C.
Click this image to view the 1919 document stating Ouida Okey’s appointment to corporal rank. 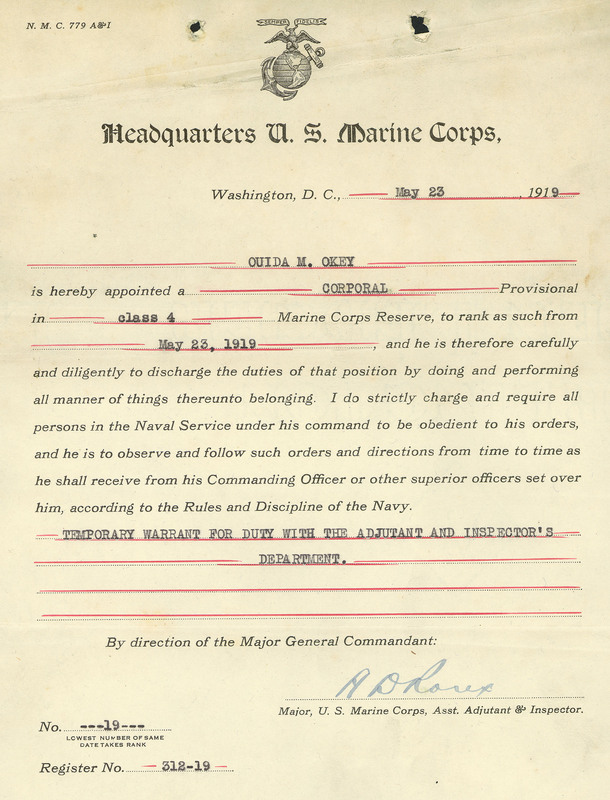 On Aug. 12, 1918 — with what would turn out to be only a few months of World War I remaining — the United States Marine Corps Reserve officially began accepting applications from women for the first time. Of about 5,000 applications from women around the country, the Marines selected only about 300. Three of those women who enlisted — Ouida Okey of Graysville in Monroe County, Mildred Cowell of Marietta and Mary A. Williams of Youngstown — were from Ohio. 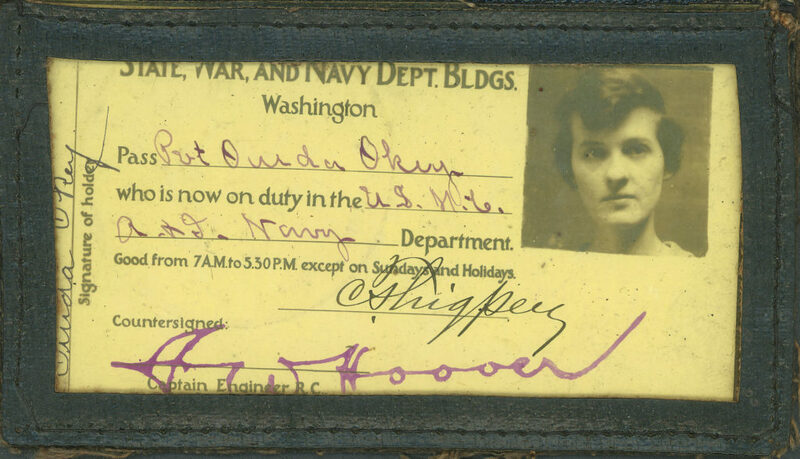 During World War I, more than 35,000 American women served in the U.S. military. 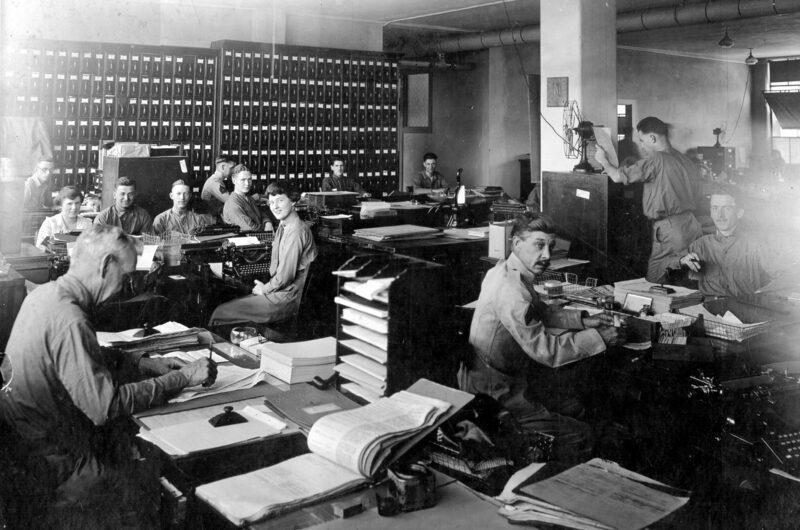 This photo from 1918 was taken at the Marine Corps Casualty Office in Washington, D.C. Ouida Okey is seated at a typewriter in the center. 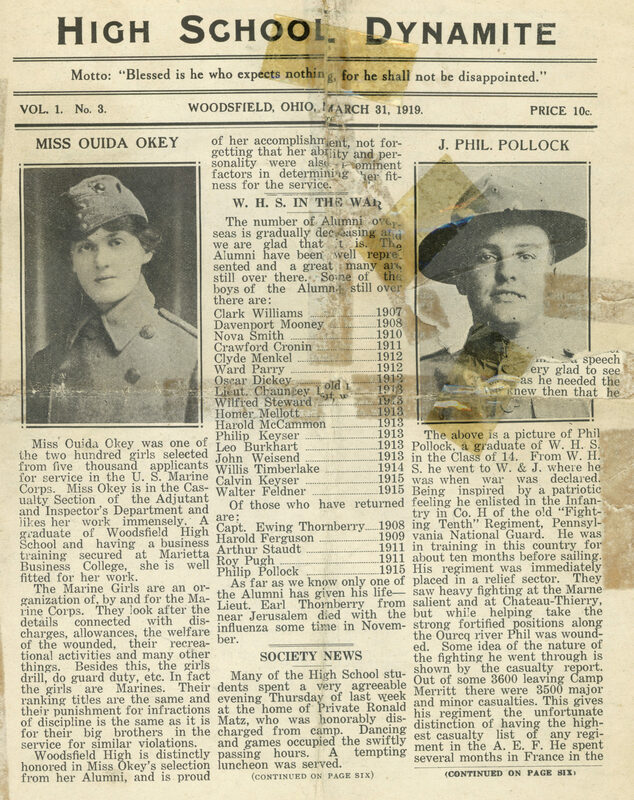 Click to view the March 31, 1919 Woodsfield High School Dynamite newspaper article about Ouida Okey. 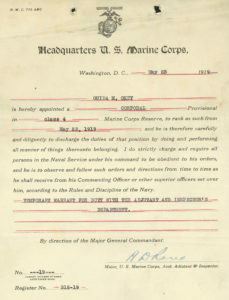 Okey served from Oct. 22, 1918 to July 31, 1919. She was appointed to the rank of corporal on May 23, 1919. Okey’s full Marines uniform is on display at Ohio History Connection, as part of the World War I exhibit. This pass allowed Ouida Okey into state, war and navy department buildings during World War I (“except on Sundays and holidays”). “It’s important to recognize that the large-scale involvement of women in the war effort during WWI was a key factor in securing women’s suffrage, which was enacted with the Nineteenth Amendment in 1920,” Birkhimer writes. Okey’s is one of the hidden-gem Central Ohio stories of World War I. Learn more about local World War I history on the most recent episode of Columbus Neighborhoods. Hundreds of men from Central Ohio’s Jewish community became doughboys. Letters from one soldier to his sweetheart back home reveal much about life at Camp Sherman, a World War I training camp in Chillicothe. This entry was posted	on Monday, November 13th, 2017 at 4:28 pm	and is filed under Blog, Story. You can follow any responses to this entry through the RSS 2.0 feed. Both comments and pings are currently closed.